When I was a youngster, I made the fatal mistake of telling a few relatives how much I enjoyed Garfield the cat. Every holiday and birthday after that, I was inundated with Garfield books, notebooks, T-shirts, and stuffed animals. I was positive Garfield would eventually be etched onto my tombstone. My love for the grumpy, lasagna-loving, Monday-hating cat has since abated, leaving even a former Garfield fan like me flummoxed as to who the target audience would possibly be for this new venture: BlogTO proudly announces that “Toronto is getting North America’s first Garfield-themed restaurant,” a “quick mobile restaurant” called GarfieldEats. So this enterprise appears to be going past cat-shaped food to offer an immersive Garfield experience. The busy website bills itself as “entergaging,” i.e., part entertainment, part information (why not “infotaining?”). 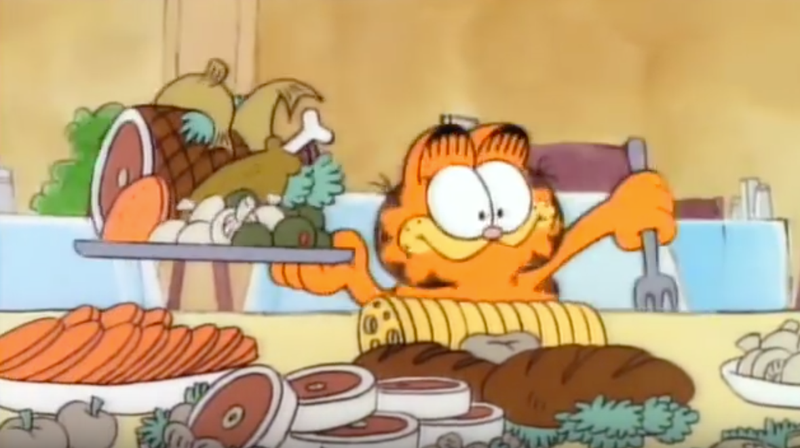 Via the GarfieldEats app, you will be able to “watch, play, order, read, collect, redeem, track, manage, chat, share and much more” to fill that current Garfield-shaped hole in your life. That’s lots of activity for a cat mostly known for his laziness. It’s still unclear why the GarfieldEats creators latched onto a 40-year-old cartoon character to anchor their “entergaging” “quick mobile” restaurant plan—can an online Heathcliff snack bar be far behind?